I am sleeping in my sitting room, under the piano. That is not quite true, I am not under the piano, and I do have a bed. I am sleeping in a bed in the room that used to be my sitting room, and is now a bedroom. The piano is opposite the bed. My mother died a few weeks ago. In order to be with her to nurse her, I packed a single suitcase and moved out of my own bedroom in my big Bognor house, and moved in with my mother. Within days, I had rented out my now empty bedroom to a nice fellow, the sixth lodger in the house, and sealed my future for after Mum died. 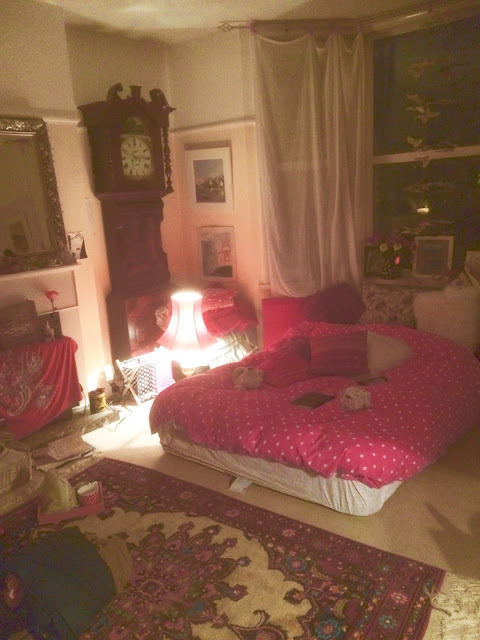 I have returned, Mother is buried, and I now live in what was my sitting room, transformed into a very large and wonderful bedroom, with a piano, and I am delighted with it. There are no curtains. I have sewn pink ribbon tabs on some gauzy wafty white curtain material which has been tied it onto the curtain rail, but they only cover the corners of the window. The middle is as see through as a big glass window can be. For bored neighbours I am a reality TV show, if they stand on the pavement just yards from my new bedroom, they can amuse themselves by watching my every move. The curtain rail is really only for show. It was put up many years ago with light exotic Indian curtains with tiny mirrors sewn into the fabric, attached to it already, so that the curtains had to be cut off when they disintegrated last month. The curtain pole was fixed to the wall with brackets that not only have half the required screws in them (making the pole very fragile and meaning that any curtains hanging from it need to be extremely light) but the brackets prevent any curtains being drawn and covering the window. So I have had to replace my old Indian type curtains with the lightest of curtains that have been tied on to the curtain rail and neither close nor protect my privacy. Being supremely visible, I have to undress by lying on the floor at the foot of my bed and wriggling about. To do this needs planning; there is no use in being able to get out of my clothes only to find I have left my pyjamas on top of the bed, by my pillows, directly underneath the large, clear, uncurtained and see through window. Hooray, say my neighbours, that's a show and a half, well worth the wait. What now? I cannot scratch my bottom, clean my ears with a pencil, or look unappealing in any way because all of my neighbours and any passer by that looks to their right, or to their left, while passing the house, can see in and become very involved with what I am doing at that moment. Giant Boy still needs to practice his piano. The room is twice the size of my old bedroom. I can hear who is coming and going at all hours, the room is next to the front door and I can in theory, burst out of my room with my dressing gown and curlers, in the early hours of the morning and catch my lodgers out with whatever it is that they should not be doing. They are great fellows, my lodgers, I won't be catching them out, but it is the fact that I have the opportunity, and the power, and the means, should I decide to use them, to assert myself and be despotic and unreasonable. I feel like I am a student again, delighted to be living in a sitting room, and hanging my clothes on hangers all around the room on the picture rail. The mattress was on the floor here before we made up the slat-less frame. It is now as delightful with the frame made up and the mattress forming a gentle V, but looks like a piece of modern art. A bed installation, which is given more meaning as it is actually used as a bed. I borrowed the bed from one of my brothers, left for many years in Mum's garage. (The bed, not my brother, was left many years in Mother's garage). It is a lovely bed, but has been made and dismantled from a flat pack state of affairs many times already, and the slats holding the mattress up have buckled. This means there is a big dip in the middle of the mattress where the slats holding it up underneath, have popped out. Not only does it mean that when the bed is made in the morning it forms a gentle V shape, it also means that if I get into bed at the side, I will roll into the middle a little like how we all used to roll down a small grassy hill as children, and I stay there in the middle of the mattress till I wake enough to climb back out again. My vision for this room is to have soft chairs in here so that I can use it still as a sitting room for my friends and me to sit and chat and have tea. So far, I have one comfy chair and a little table, and strangely enough, I am content with just the one chair. I sit in my chair and read, and write, and think. In time, I will bring the little sofa from outside the kitchen into this room, but not just yet. I have to find a wardrobe and a chest of drawers so that all my things can be put away, and space created, but just now, I like the feeling that I have just arrived, and that all my things are placed around the room in boxes and baskets, and clothes hung from hangers from the picture rail. I feel as if I were a character in a late nineteenth century Parisian or Russian novel, newly arrived with lovely things and no furniture into a large room with big windows, my boxes filled with clues from my past, and a single comfortable chair in which to sit and have tea and consider my future. My mother has died. Everything has changed, and nothing has changed. Life goes on, it tends to do that, and that's fine. Time can be a very kind thing, it carries us forward whether we like it or not, and every space that is created after such a thing as a death, has the possibility of being filled with other things. My mother has died and I held her as she breathed her last breath in, and let it go with a sigh. My hand was on her chest over her heart so that she would know I knew what she was doing. When her heart stopped, we would both, Mum and I, know. It was our final connection in this world. My daughter was holding her grandmother's hands, and in the early hours one morning, Mother ceased to be alive. I am not filled with grief. I do not cry and I do not feel as if my world has ended. Quite the opposite, I feel as if my world is beginning again. My mother's gift to me was, and is, the gift of life. I miss her terribly, my heart is heavy. I love her, and I want to be alone and silent. But that is not a bad thing. Her dying was her final lesson to me, and when my time comes, I will remember it. The value of my own life is highlighted by the end of hers. And so, in my new room, here in my sitting room that is now my bedroom, I am sitting alone on my single soft chair and letting time settle my mind, and wondering what it is that I want to do, and be, now. Her death has freed us both, she would like that. My daughter will have a baby in December, I am the new Grandma. When I was a new mother, my mother was there to show me what to do. I am to be a grandmother now, and my mother has left the scene, giving the role over entirely to me, to make of it what I can. So today, here in my Parisian or Russian novel, I sit in my blue and white spotty dressing gown from Primark, in my single soft chair wrapped in a raspberry pink woollen blanket from Ireland, thinking of my day ahead. There is much that I have to do, but what is coming through from being with Mum as she died, is that I don't want to do any of those things. I want to be free to think, and to take time to paint in my studio, for fun. I want to have time to read, and to stay still, and to have no plans. There is a great deal of assessing going on in my mind, and body, it needs space to form and become words and images, it needs silence and freedom from commitments to become something I can express in the best way I can, which is creatively. There is no hurry. My unformed bedroom and my unformed thoughts are part of the process of making sense of what my life is going to be without my mother. She has entered eternity, and I am taking something of that time and space here, to recover and think things through. Perhaps I will get up now and go and find a wardrobe. That is enough for now. At some point, I will cover the window and prop up the bed, but it doesn't bother me in the way that it would have before Mum's illness. You never do know what is around the corner, now could be the only time you have to sit and think. Not being busy is a whole new experience, a new mindset to get used to. Letting in the long moments, the stillness, the freedom, is both hard work, and easy, all at the same time. Time to get the show on the road. Time to entertain the neighbours with getting dressed and making the bed. Time to walk slowly into the day, and to consider each moment enough in itself. And, perhaps, today, to buy a wardrobe. Perhaps. Mum came home in her coffin for all her friends and neighbours to say goodbye. I polished this table like a mad thing, if she came back and couldn't smell the polish, I'd be in trouble. Except of course she can't smell anything, and nor would she want to, being on a cloud with a harp and some wings, along with most of her friends and her mum, dad and siblings.